Pogatschnig was an Italian architect. He was born in Parenzo (Poreĉ, Croatia). After attending the Italian language Lyceum in Trieste, he fled to join the Italian army at the onset of the First World War, adopting the Italian translation of his name, Pagano. He was twice wounded and twice captured. In the years immediately following the war, Pagano was associated with Nationalist and pre-Fascist politics, and would be among the founders of the first fascist party of his hometown of Parenzo. In 1924, Pagano graduated from the Politecnico of Turin, with a degree in Architecture. In 1920s, he started designing his first buildings, like the Gualino office building in Turin (1928), and working on exhibitions in Turin and soon in Milan. In 1931, he moved to Milan to work for the architecture magazine La Casa Bella. From the late 1920s, Pagano had adopted a rationalist position, influenced by futurism and by the European avant-gardes. He had a significant career as a writer and defender of rationalist architecture in the presses, especially Casabella, whose name he soon changed from La Casa Bella when he became director of the magazine in 1933. He was involved in the V Triennale of Milan in 1933, in which he collaborated in the design of the House with a Steel Structure, the 1934 Aeronautics Show, which he was responsible for designing, and the VI Triennale of 1936, of which he was in complete control. All three expositions were held in architect Giovanni Muzio's Palazzo dell'Arte in the Parco Sempione, which had been built for the V Triennale, the first held in Milan. From the mid-1930s, Pagano's architectural philosophy led him farther and farther from the official architects of the Fascist regime, such that his VI Triennale, in effect, proposed an alternate architectural expression for Fascism. His position in the Fascist party and prestige among architects, as well as the diversity of cultural production under Mussolini's Fascism, allowed him to openly critique some of the regime's constructions as "bombastically rhetorical," from the pages of Casabella. 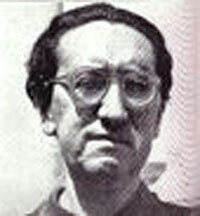 In 1942, Pagano would leave the Scuola di Mistica and the Fascist Party. In 1943 he made contacts with members of the resistance, was captured in November of 1943 and imprisoned at Brescia, and escaped in July of 1944. He was recaptured in September of 1944 in Milan, imprisoned at Villa Triste, tortured, and transferred to the prison of San Vittore, then to Bolzano and then to Mauthausen, Melk and back to Mauthausen. Pagano Pogatschnig died at the Mauthausen concentration camp in Germany on the 22nd of April, 1945.